Pres. 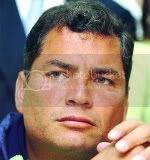 Rafael Correa of Ecuador, another statesman of quality in the rising new Latin America shaking off the gringo chains. As to the 300, I must note that the FARC’s previous prisoner exchange involved 300 prisoners. Is that what the ‘300’ refers to? ¿Quien sabe? Unlike Uribe, Bush and the US press, I won’t guess or make up a phastasmagoric story about Chavez mailing checks to the jungle. Watch Greg Palast’s reports from Venezuela and Ecuador for BBC Television Newsnight and Democracy Now! Compiled on the DVD, “The Assassination of Hugo Chavez.” He keeps extremely busy following the shenanigans of prostitutes and criminal opportunists in the Anglo-American political classes. Posted in IDEOLOGICAL COMBAT, THE LEFT & PSEUDO LEFT, WOMEN.